Retired July 1, 1979. Died Sep. 29, 1990. Brigadier General William H.L. 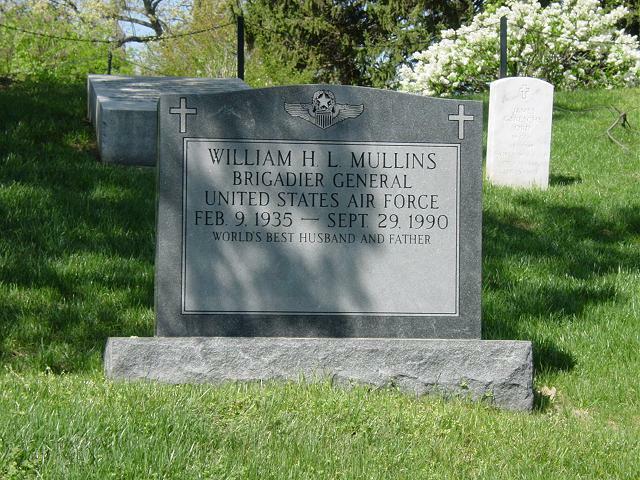 Mullins was deputy director, Legislative Liaison, Office of the Secretary of the Air Force, Washington, D.C.
General Mullins was born in Independence, Missouri, in 1935. He graduated from Hannibal High School, Missouri, in 1953; the U.S. Military Academy at West Point in 1957; and the University of Arizona, where he earned a master's degree in business administration in 1966. General Mullins is also a graduate from the Squadron Officer School, the Air Command and Staff College, and the National War College. Following graduation from the academy, General Mullins attended flight training and received his pilot wings in 1958. Following advanced pilot training, he completed his first operational assignment as an F-100 pilot with the 8th Tactical Fighter Wing at Itazuke Air Base, Japan, serving from June 1959 to June 1961. For the next two years, General Mullins was aide-de-camp to the commander of Thirteenth Air Force at Clark Air Base, Republic of the Philippines, while remaining combat-ready in the F-100. In July 1963 he returned to the United States for assignment as an F-4 instructor pilot, with duty at MacDill Air Force Base, Florida, and later at Davis-Monthan Air Force Base, Arizona. General Mullins attended the Air Command and Staff College at Maxwell Air Force Base, Alabama, from August 1966 to August 1967. He then rejoined the 8th TFW at Ubon Royal Thai Air Force Base, Thailand, as the wing F-4 Standardization and Evaluation Chief. General Mullins next had duty as a staff officer at Headquarters U.S. Air Force, Washington, D.C., where he served in the Directorate of Operations from August 1968 until June 1970, when he was reassigned to the Directorate of Budget. In August 1971, he entered the National War College at Fort McNair, Washington, D.C. In July 1972, General Mullins was assigned to the 4th Tactical Fighter Wing at Seymour Johnson Air Force Base, N.C., serving first as assistant deputy commander for operations and later as deputy commander for operations. In March 1974 he was selected for duty as a member of the Chief of Staff's Six-Man Group. General Mullins joined the Secretary of the Air Force's Office of Legislative Liaison in April 1975 as chief, House Liaison Office, and in April 1977 became deputy director, Legislative Liaison. A command pilot, General Mullins flew a total of 146 combat missions, of which 116 were over North Vietnam. His military decorations and awards include the Distinguished Flying Cross with four oak leaf clusters, Bronze Star Medal, Meritorious Service Medal with oak leaf cluster, Air Medal with 12 oak leaf clusters, Air Force Commendation Medal with oak leaf cluster, and Air Force Outstanding Unit Award with oak leaf cluster and "V" device. He was promoted to the grade of Brigadier General September 1, 1977, with same date of rank. WILLIAM HARVEY LOWE MULLINS, or "Moon" to most of us, entered West Point in July 1953 from Hannibal, Missouri. He came to the Academy inspired by venturing into the unknown. He came through Beast Barracks with his sense of humor intact, his promising tenor noted, and a zest to overcome whatever the challenges of cadet and academic life in Company B-1 had to offer. He found his keen analytical mind to be very useful in easily maintaining an upper-third class standing as academics came into play. The twinkle in his eye and an instant smile proved to be invaluable signals of a sense of humor that served him well. His athletic abilities were much in evidence as he tried virtually all sports. He settled on glee club, a quartet and lacrosse. He rose to prominence in all three areas, attracting All-American honors in lacrosse, the top tenor in the glee club and then quartet lead. He also fooled the tactical department into some heavy stripes on the Regimental staff as a firstie. These were all early signals of a leadership quality that jelled quickly as he successfully met all the challenges of Air Force flight training and emerged as "...the world's greatest fighter pilot...," a label he humbly accepted and adopted for the rest of his far-too-short life. Each USAF fighter pilot is trained to believe he meets this standard. "Moon" probably invented it. He moved up the USAF beaten path of job responsibility, flying experience and leadership exposure faster than anyone in the Class of 1957. By 1962 he was in the Philippines, serving as aide-de-camp to the Commanding General, Thirteenth Air Force, General Milton, an early and an enduring mentor. His guided and unguided tours of Manila, Baggio and Japan emerged as musts for all visitors. All of this was " BF. "BF was "before Florine," or Flo. Moon and Flo met and were wed in record time. Young Todd came along as their first child. All too soon, Todd was diagnosed with as virulent a case of arthritis as one can have. Moon and Flo approached the illness as they did life itself - seeing the upside while rejecting the inevitable downside of serious illness. Todd’s fight has been their fight from the beginning. Soon, another son was born, and Dan Mullins quickly filled all their lives as another son, and brother to Todd, with the joy of that patented Mullins philosophy of making work fun. Todd’s fight with arthritis, Dan’s emergence as a varsity athlete on the Air Force Academy football team and Moon's becoming the first member of the Class of 1957 to become a flag officer all kept the Mullins family operation in high gear. As a combat veteran with his Vietnam F-4 heroics, Moon was promoted early for the fourth time. Leading the Department of the Air Force congressional liaison effort at perhaps its most successful level of performance was routine duty to Moon. With his congressional duties he became a very close professional associate and personal friend of the Speaker of the House, Congressman Tip O’Neill. Moon's early AM renditions of "Danny Boy" became one of the "musts" in Washington social circles of the day/night in any weather, of course. Moon retired to take an executive position with General Dynamics, where his natural abilities to juggle many complex issues and achieve the best results for his beloved Air Force led to continued success. He rose to vice-president and chief of the Washington office while GD was the number one defense contractor in the US. He was routinely identified as a rare fellow who could succeed in Washington and still be a decent person. Several things distinguished Moon Mullins from among his peers. The most vivid distinction was his personal joy in living and loving life. He was everywhere one should be, doing all the things one should do, and enjoying every minute of what others referred to as work. To close the Moon Mullins story is not possible. No one who knew him has let him go. He lives in each of us, and we are all much better for having known and loved "Moon" Mullins. The shock, sorrow and sadness of the loss of this joyous, full-of-life comrade in arms persists. The passage of time helps, but the memories live on. Life goes on, and so too does Moon-in each of us. Todd continues his fight and Dan and his recent bride Lisa are pressing on into another Mullins’ career as "...the world's greatest Air Force pilot...". Flo copes and goes on with life ... with class. Moon is proud of all of them. It is wonderful to have such a friend. We hope and trust everyone has a Moon.